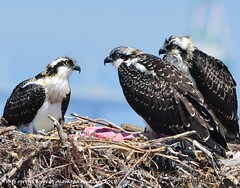 The spring of 2011 saw the return to Alameda Point of a nesting pair of ospreys. 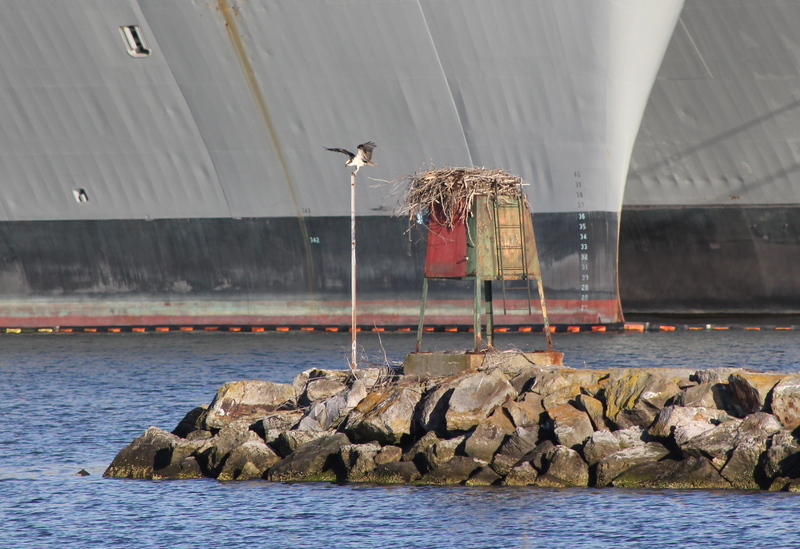 This pair set up their nest on the same light stand at the entrance to the Seaplane Lagoon as another osprey pair, or perhaps the same pair, had done in 2009. Unlike 2009, this year the area is fenced off for cleanup work, making it difficult to get good photographs. 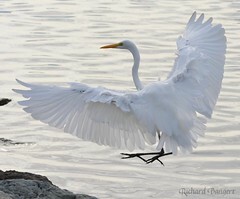 It was a pleasure to watch the adults change shifts on the eggs and go off to catch fish. Although they may sometimes prey on small ground dwelling animals, their diet is normally restricted to fish. 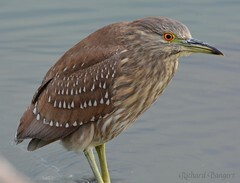 Often they could be seen heading north across the Seaplane Lagoon just inches above the water attempting to grab a fish. What was remarkable to witness was their flying technique. The osprey that I watched one evening was propelling itself just inches above the water for a few hundred feet, skimming the surface with its unique opposing claws ready to clutch a fish. 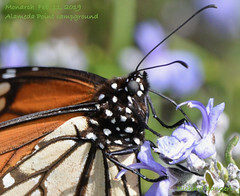 Up would go the wings to almost full vertical, and then come down in an arcing motion, cupping the air and thrusting it forward. 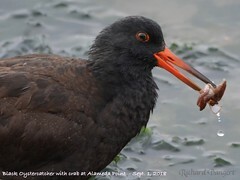 When they returned with a small fish, they would usually perch on either the tip of an old metal post next to the nest or further west on the breakwater on a post with a horizontal arm. After having their fill, they would share with their mate. 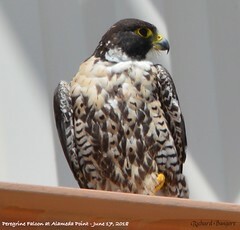 Unfortunately, vacation plans interrupted my photography before the chicks hatched and fledged. While the osprey is not an endangered species, it is certainly an environmental asset and a beautiful creature to watch – so much so that many communities throughout the U.S. build perches around lakes and bays to attract ospreys during the nesting season. 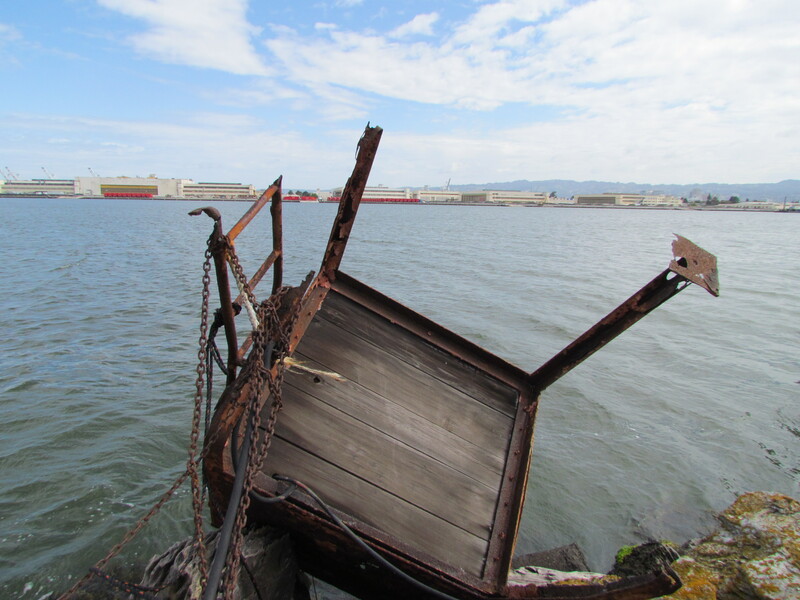 Alameda should emulate these efforts and adopt a policy of not only permanently preserving the old light beacon stand that was used this year; we should also refurbish the other one on the east breakwater that is tipped over and hanging on by a chain. We should make provisions for when the cleanup fencing is removed. 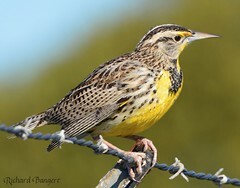 Perhaps a small fence at the entrance to the west breakwater to prevent deliberate or uninformed intrusions into the “nesting space.” We could have organized viewing programs during nesting season. One way to generate interest in the ospreys would be to install video cameras in some new poles next to each nesting platform. 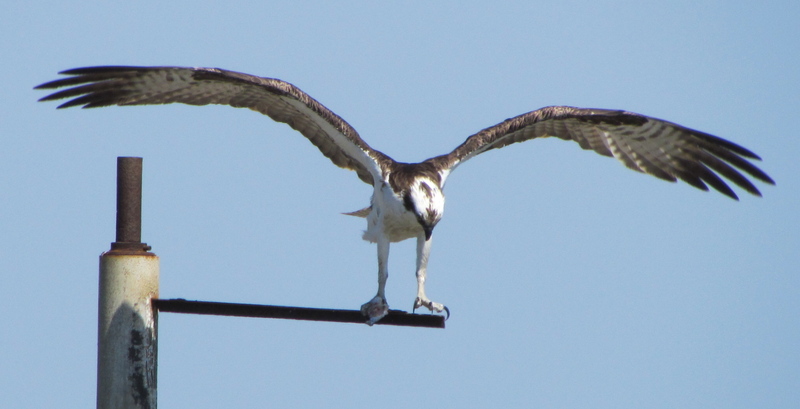 A pole with a horizontal perch would be more useful to the osprey and a good way to have one camera facing into the nest and another one facing out toward the lagoon with streaming video. 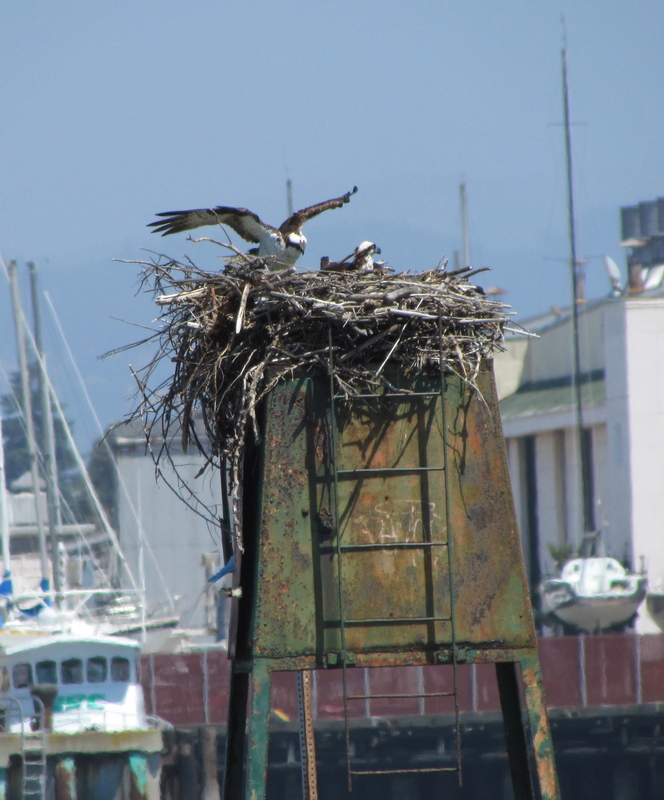 To place the protection of osprey nesting sites in perspective, it is instructive to know that if the light stand used for nesting were a tree in a logging area of California, it would be illegal to cut it down. Nesting sites are protected in our forests, and they should be protected here. Without a proactive effort now, I fear that one day we will find that the old historic light stands have been thrown away. 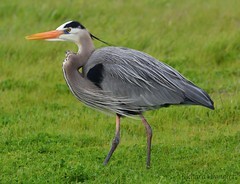 The open space and wildlife resources that we have at Alameda Point are priceless. We should make an effort to preserve them, especially when we have visitors like the ospreys. Radioactive radium waste not an issue The massive pile of dredge mud that has been sitting between the Seaplane Lagoon and the hangars is now dry enough to be tested to determine the exact contaminant profile and hauled away. The contaminant of greatest concern to community has been radium-226, the radioactive ingredient once used to make aircraft dials glow in the dark. Testing revealed that the sediment did not contain elevated radium levels and therefore would not need to be disposed of at a special radioactive waste site. There were several solid objects, referred to as “buttons,” that were found which contained elevated radium. Those objects and the surrounding soil were removed for special disposal. 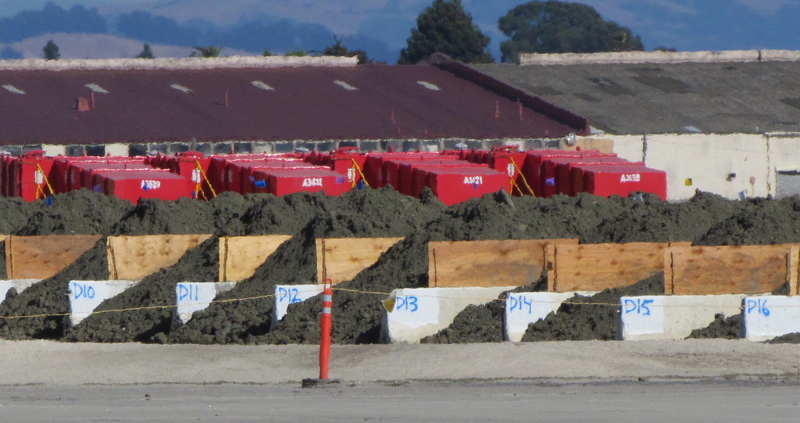 The piles of dredge soil neatly arranged and numbered next to the old Control Tower are waiting to be hauled away to a hazardous waste disposal site. In addition to trucking dredge soil to a hazardous waste site, there is a large mound of asphalt that is being trucked onto the wildlife refuge and out to an area where clean soil and fill material is being stored for future use. This asphalt is from a temporary pad that the Navy laid down in the dredge soil dewatering area. It was covered with plastic and not contaminated, and now it is no longer needed. 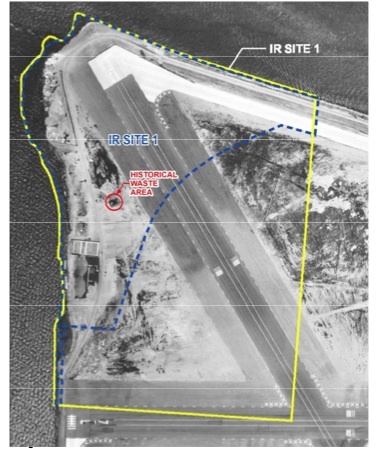 After years of investigation, the Navy, along with the federal and state regulators, has come up with a remediation plan for 39 acres, encompassing five sites, called Operating Unit 2A. On Wednesday, August 31, the Navy will spell out its plan for remediation and solicit comments. The meeting will be at City Hall West at Alameda Point, 950 West Mall Square, Room 201 from 6:30 pm to 8:00 pm. Operating Unit 2A is roughly one block away from the soccer fields on the south side of Alameda Point and one block away from the USS Hornet. The Unit has contamination issues that date back to 1879 when the Pacific Coast Oil Works Company began operating an oil refinery near Main Street. Building 410 is where the Navy operated an aircraft paint stripping facility. The soil was found to be clean, but toxic chemicals seeped into the groundwater. The conclusion reached by the Navy and regulators is that no active remediation efforts need to be conducted. Instead, they will rely on “natural attenuation,” which means to let nature take its course through dilution, dispersion, and biodegradation of the contaminants. 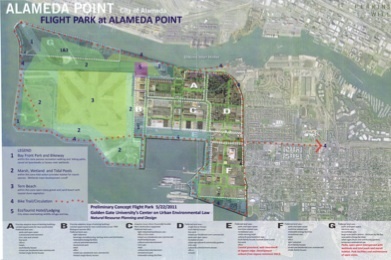 Greenspace Project's concept for interconnected park system at Alameda Point. Shown as an overlay on existing "Going Forward" city map. Red letters indicate project additions. Link to map with zoom feature at end of post. 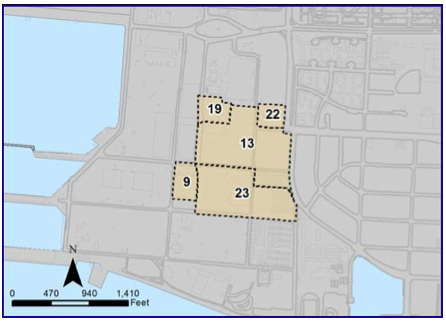 Parks and open space planning for Alameda Point has been hobbling along for 15 years. We still do not know when or who will be welcoming visitors to the Wildlife Refuge. We still do not know who, when, or what will happen with the Northwest Territories. These two areas, located in the runway portion of Alameda Point, comprise over 700 acres. Linking these two areas together with the Seaplane Lagoon frontage and the future Enterprise Park extending to the Encinal Boat Ramp is the vision of the recently launched Greenspace Project at Golden Gate University (GGU). The Greenspace Project wants to get all the stakeholders – local, regional, state, and federal – in one room, on the same page, so that not only Alameda, but the entire region, can benefit from the exceptional and rare opportunity for creating a world-class park system at Alameda Point. 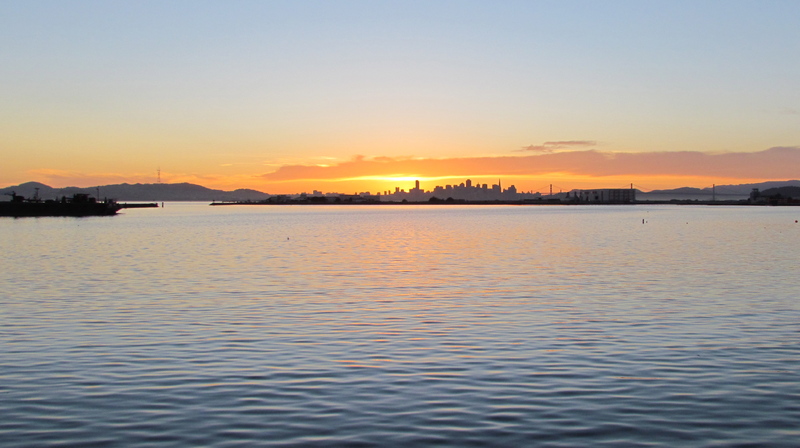 And they want to do it now, before the Environmental Impact Report for Alameda Point is drafted. Site 1 indicated by blue line. Yellow line indicates entire area used by Navy as a disposal area from 1943 to 1956. Red indicates waste pit that caused groundwater contamination. Navy photo and overlay. 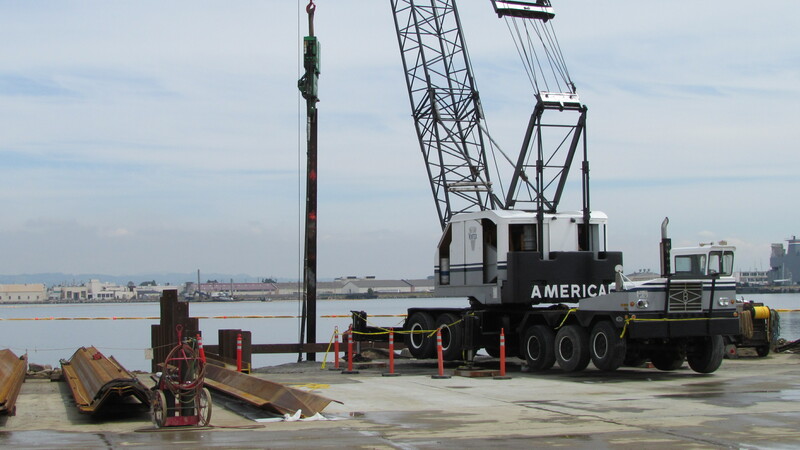 The Navy is proceeding with plans to remediate contaminated groundwater at the old disposal site at the northwest tip of Alameda Point. The contaminated groundwater is within the area known as Site 1, which encompasses over half of the old dump. In one particular area of the dump, the Navy routinely dumped liquid waste material. No one knows for sure how much of it was in drums that may still be rusting away, and how much was just poured into the pit. Sun sets on dredging project for this year - to resume in 2012. Fence is down on east side of lagoon, which will allow sunset viewing and bird watching throughout the remainder of the year. Seaplane Lagoon dredging barge is gone, not having completed the job on time. 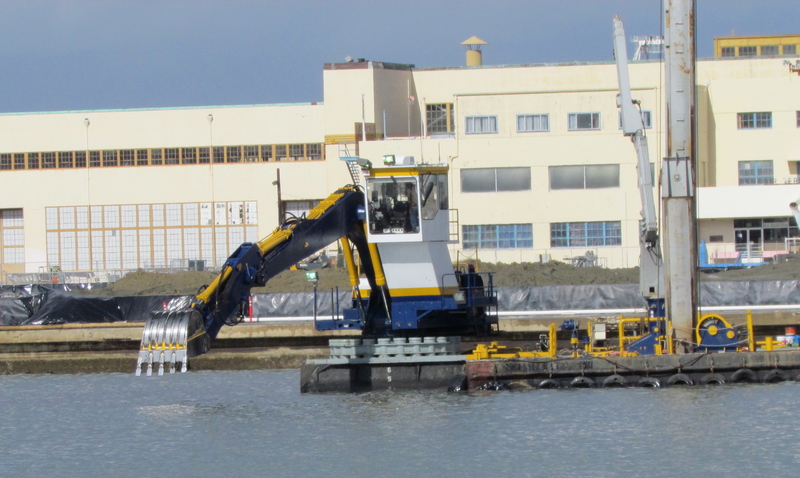 The Navy was expecting the contractor to complete the dredging of both the northeast corner and the northwest corner of the Seaplane Lagoon by mid-April prior to the arrival of the endangered California Least Terns. 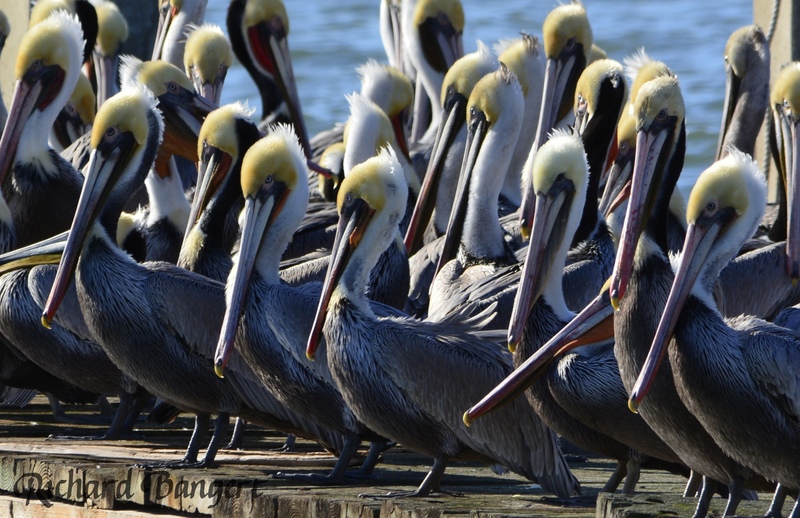 The terns nest on the Wildlife Refuge and feed in the Seaplane Lagoon and nearby waters. It is illegal to disturb them while feeding and nesting. The contractor completed the northeast corner, but work was halted before starting on the northwest corner due to the arrival of the Least Terns. The dredging will resume in early 2012 and be completed by mid-year. It is unclear at this point whether the Navy will incur an additional expense for the dredging operation, since it was not completed by the deadline, and the dredging equipment had to be demobilized. The existing piles of dredge soil on the tarmac near the Air Museum and Bladium will be hauled away this summer. They will be tested for radium-226 and other contaminants in order to determine where they will be disposed of. The fencing along the eastern side of the lagoon has been removed, and the dredging barge is gone. A separate project on the western side of the lagoon is continuing. It involves removing the last leg of the old sewer drain line that was removed due to radium-226 contamination. A steel barrier has been constructed in the lagoon to prevent contaminants from entering the water during the project.